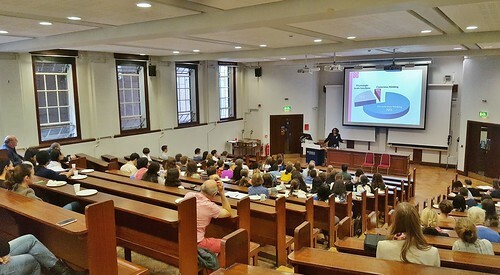 The Department of Engineering celebrated National Women in Engineering Day on June 23 with a forum on addressing unconscious bias and a visit from Cambridge TV to interview two female researchers about their work. Guest presenter Donna Carty of Challenge Training Consultancy was invited to speak at the Department to an audience of about 100 men and women in an event entitled ‘Addressing Unconscious Bias.’ The forum was sponsored by Taylor Vinters and TTP plc. and organised and hosted by Camille Bilger, PhD student in the Energy Group. During the forum, Donna explored how, despite the best efforts of companies and universities to ensure diversity, efforts can be undermined by unconscious bias – the unintentional preferences formed by our socialisation and experiences. These pervasive and often negative biases can play out in the workplace and affect all people regardless of gender, race or religion. In order to address these biases, Donna posited, it’s important to be aware of the micro-messages we broadcast and to step back by developing a constructive uncertainty surrounding the people with whom we interact. As the theme of National Women in Engineering Day 2016 was raising profiles of women in engineering, the Department’s Women in Engineering website published several profiles of students and staff that demonstrate how women are forging successful paths at Cambridge in all branches of engineering and at every level. Finally, Cambridge TV looked at the important roles of women in engineering by visiting the Department and interviewing Dr Jenni Sidey, University Lecturer in Internal Combustion Engines, and Camille for a story airing during the daily news programme. The video is embedded above. This article was originally published by the Communications Team on the main Department of Engineering website.